This op-ed was originally published to the Los Angeles Times. 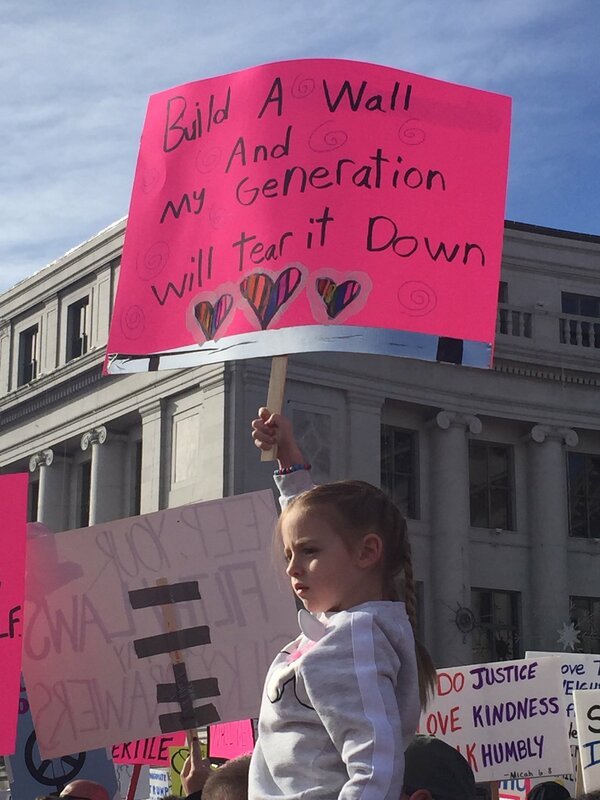 “Build a wall and my generation will tear it down,” read a sign held by a young anti-Trump protester at a recent rally, a cry reiterated by Rep. Joe Kennedy in his response to President Trump’s State of the Union address. That sentiment could serve as a slogan for millennials, now in their 20s and early 30s, who are well placed to serve as a bridge between the older adult population and the Americans who are now in their teenage years or younger. One major fault line in our divided America is generational. The last three presidential elections, for example, showed a sharp split along the dimension of age. In each, those over 40 voted primarily for the Republican candidate, while younger people voted primarily for the Democrat. This divide, evident in areas other than politics, has demographic and cultural underpinnings. Forty-four percent of millennials are racial minorities: Latinos, blacks, Asians and other smaller groups. Three out of 10 are first- or second-generation Americans, and 1 out of 6 are multilingual. Millennials are thus on the front lines of the nation’s diversity shift, between the baby boomers and Gen Xers who are more white, and the post-millennials, sometimes called Generation Z, who are less white. By the year 2035, millennials’ elders will be 65% white, and those younger than them, who will make up nearly half of the population, will be 46% white. Whereas older whites express fears of what the changing racial and ethnic demography means for the nation’s future and possibly their own safety — fears fanned by President Trump’s signature positions on immigration and policing — millennials are known for their tolerance. Nearly 1 in 7 millennial marriages is multiracial, compared to 1 in 20 among baby boomers when they were the same age. In contrast to adults over 35, a majority of millennials believe that, since the 1950s, American culture and way of life have mostly changed for the better. They are also more likely to believe that immigrants strengthen the country and that America’s best days lie ahead. It’s not just millennials of color who support a more diverse America as well as the politicians who promote it. Millennial whites, far more than older whites, also espouse favorable views of immigration and the nation’s future. Perhaps the most important attribute of millennials as a bridge to America’s diverse future is their relentless optimism. If millennials are to succeed economically, and to lay the social groundwork for the highly diverse generations that follow, we urgently need to invest in a variety of education and safety-net programs. While millennials as a whole have achieved higher levels of post-secondary and college educations than their elders, black and Latino millennials have fared decidedly worse than their white peers on those measures, as well as on home ownership and income — often a consequence of under-resourced schools and community services. The current administration is doing the opposite of what’s necessary. Fueled by an older political base that does not view diverse millennial families as their children and grandchildren, Trump and the Republican-controlled Congress tried to gut the Affordable Care Act and passed a tax law that will dramatically increase the federal debt, paving the way for cuts in domestic programs that would aid young families. Damage will continue unless, and until, the demographic clout of millennials and their successors is more fully realized — clout potentially delayed at the ballot box by racially-targeted voter suppression and gerrymandering. Political leaders need to view millennials and their children, both native and foreign born, as the core of America’s future labor force and prepare them for a more globalized economy. At the same time, they should make the case to their too often fearful political base that they have a co-dependent relationship with this racially diverse America. While millennials will benefit from government investments in their well-being today, older Americans will benefit from their contributions to Social Security and Medicare for decades to come. Perhaps the most important attribute of millennials as a bridge to America’s diverse future is their relentless optimism, especially minority millennials who actively embrace the American Dream. A 2017 GenForward survey found that Latino, Asian and black millennials are more likely than whites to say they will do better financially than their parents. By example and as advocates, millennials of all racial backgrounds will undoubtedly continue to make the case that investing in a more inclusive, younger America is essential to the nation’s economic success and can only help today’s older populations. Older Americans should listen, and help make the country whole.